Here at Hackaday the only thing we like better than giant whirling artistic desert based contraptions are interactive giant whirling artistic desert based contraptions. [Peter Hudston]’s Charon is no exception. Known for his strobe sculptures [Peter] has returned from a two year hiatus with possibly one of the craziest and nightmarish sculptures found on the deep playa. 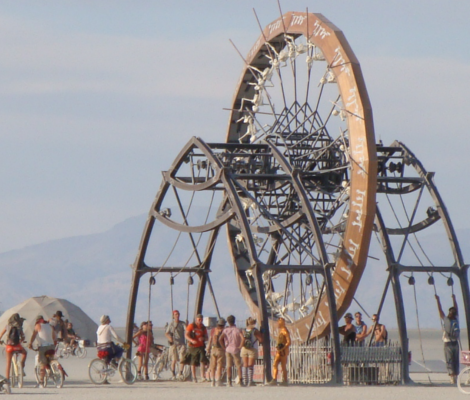 The work features a gigantic spinning wheel that has posed human skeletons mounted on it’s inner edge. Onlookers can pull a series of 6 rope pairs which cause the wheel to rotate rapidly. When the rope pullers are coordinated enough to get the wheel spinning at the right speed, a strobe is activated revealing the skeleton’s animation. I wandered over to this thing one night after hearing the local buzz about the piece. The towering wheel was spinning away as the rope pullers of the moment tried desperately to get the strobe to activate, every couple of minutes or so somebody would try and coordinate the pulling only to confuse things. From my perspective it seemed to be very difficult to get the right speed, and the pullers had to yank the rope practically to the ground. During the short time I was watching the piece (jaw to the floor) the strobe activated once or twice and honestly it was completely worth the effort. To see what this monster looks like in action check out the video after the jump. When you said “human skeletons” I thought you meant real ones. I have to admit the animation was pretty impressive and would fit into a haunted house (if it would actually fit into the building). The only thing that would have made that better is if the mouths were opened when the skeletons looked over like they were yelling at the onlookers. Overall, awesome build and pretty cool. That is amazing! How much work? did anyone else thing stargate when they first seen it? one of my two favorite things on the playa this year, the other being the Temple. it was VERY VERY hard to get it going at the right speed… the ropes were thick, heavy, and very splintery, and yes, you had to pull your end almost to the ground. i was huffing and puffing like a mofo by the time we got it working, but as you said, it was totally worth the effort. i think these skeletons were actually a bit larger than human-sized. it was great how he looked out AT you as he rowed along. super creepy. oh, also, this video was taken later in the week, when the pullys (pullies?) were REALLY squeaking and complaining. (WINCE!) the dinging bell seemed to indicate when you had passed another threshold of speed, too — i think there were three or four thresholds you had to pass to get the strobe to kick in. Ah, yes I forgot about the splintery ropes. I had heard a rumor that the creators came by and showed everyone how it should be done. Supposedly if the two opposing pullers kept the rope taught they could do a minimal amount of pulling to get it up to speed, but everyone I saw was wrenching the thing all the way to the ground. Did anyone else notice that one of the skeletons is giving everyone the finger? I ended up on one of the ropes when our MV was roving the playa on Thusrday night. Tricky to get it up to speed but the payoff was totally worth it. I saw this in person, but only during the day. It was pretty impressive, although I still think the steampunk flamethrowing octopus (all mechanical, no processors) has it beat. Now you have to ask yourself the philosophical question, are the people moving the skeletons, or are the skeletons moving the people? It was very cool. When I saw it being built, before the skeletons were in place, I thought it was a giant bubble machine. I also saw it working with the motor (no ropes) and it was very impressive, but I was tolled that the motor failed shortly after that. It was very helpful if you could place your focus at 6 o’clock while it was rotating. The octopus was very impressive too and it was to bad that they ran out of money to finish it. Next year? oh my god!! you were the bubble machine guy!! we were so delighted with your guess as to what it was. you won. it woulod have been so much easier to make that bubble machine… next year? Um am I the only person that thinks how the hell do they get these massive pieces of art to burning man. We loved that zoetrope even more than the last one!